All Shook Up: CAST ANNOUNCEMENT! 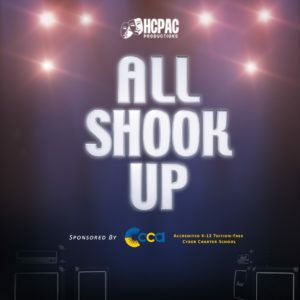 We are ready to shake it up at HCPAC as we announce the cast of ALL SHOOK UP! If you are accepting the role, you must email us no later than 9AM on Monday, December 10 at productions@thehcpac.org to confirm your acceptance. Roles that have not been accepted via emailing the above address by December 10 will be recast. Please note that a production meeting and first rehearsal is scheduled for Saturday, December 15 at 9AM. You must register online prior to the first rehearsal. A registration link will be posted on our website and emailed to you by Tuesday, December 11. Please follow the link to the All Shook Up Announcement page on our website to register. Your registration must be completed prior to attending the first rehearsal. If a fee waiver application is desired due to a financial need, please contact our Executive Director at swebb@thehcpac.org prior to December 11 to request an application. Casting is listed by audition number and first name, last initial (when appropriate). SYLVIA – #28 Ashley T.
LORRAINE – #3 Ashleigh S.
HENRIETTA – #10 Kaitlyn V.
BARFLIES – #7 Lisa, #8 Susan, #30 Marsha, #26 Samantha, #10 Kaitlyn V.